Errors, viruses and other problems are inevitable especially if we often use our computer in doing a lot of tasks that involves surfing the Internet and tweaking some settings and values in the registry. More trouble also comes to the surface especially when drivers become outdated and the machine itself becomes sluggish but thankfully, Windows has a solution to this which is called System Restore. 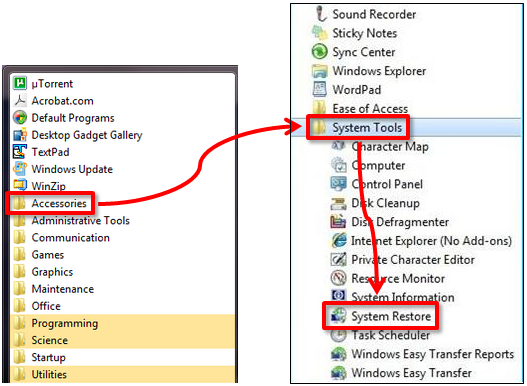 To learn what the System Restore Tool does and how to use it both in Windows 7 and Windows 8, just read on towards the end of this tutorial. System Restore is a tool that comes along with other Windows utilities and is used to reverse changes like registry tweaks and other system alterations that has caused Windows to become unstable. Windows System Restore works like the undo button that we commonly use when working with files and other documents but this one works with the system itself and restores harmful changes on registry keys, drivers, programs and other system files which may have caused problems with the overall system performance. Windows is not only vulnerable to viruses but with other problems caused by errors in the system itself and using the System Restore tool is the easiest and the quickest way of solving it especially if you are still working on some stuff and re-installing Windows just isn’t possible. 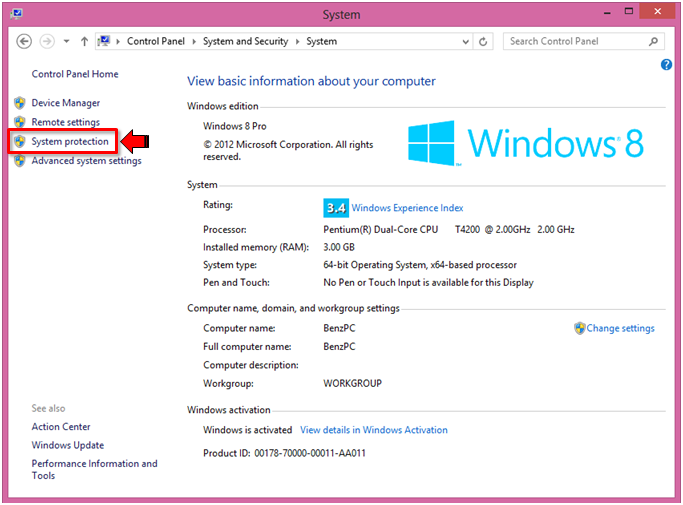 Windows System Restore is set active on Windows 7 and Windows 8 by default. This tool takes a snapshot of the system and all the contents on the drive and saves it in the form of “Restore Points” every time significant changes are done like software/program installation, driver update or other changes that does some tweaks to the registry. 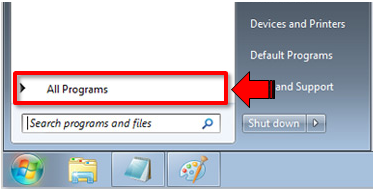 You can also create system restore points manually when you feel it is really needed so the next time you encounter some serious problem with your Windows computer that looks like impossible to fix, you should first the reverting your system back to an existing “Restore Point” and continue using your machine as if nothing happened. 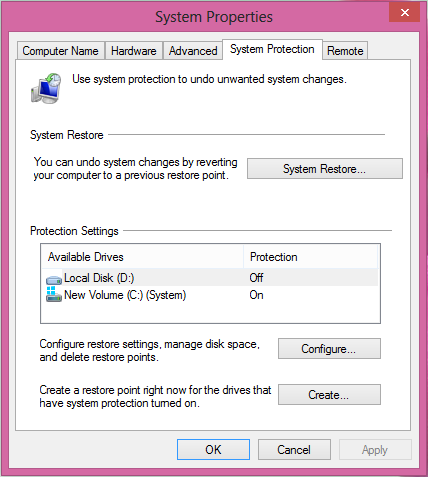 Windows System Restore only reverts all changes back to the specified restore point. This means that all changes in the registry will be restored to a working state. Using this tool does not affect files and other documents which you were working on when you restored your system so it means that they are still intact even after a system restore process. 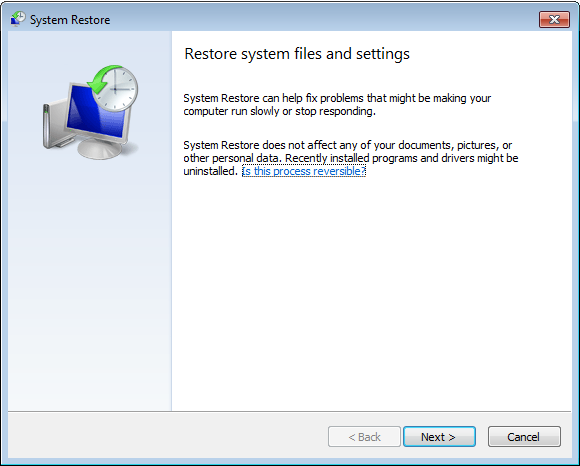 Launching the System Restore tool can be done in two ways in Windows 7. First, you can open a restore point which was previously created and perform the system restore task right away or open the tool itself so you can make further tweaks and choose other advance options before doing the process. First, you need to open the “Start Menu” by clicking on the “Start Button” or pressing the “Windows Key” and once the “Start Menu” appears, click on the “All programs” link located just above the search box. A list of all programs and system components will then appear. From this list, click on the folder labeled “Accessories” and once it expands, look for “System Tools” then “System Restore”. The “System Restore” wizard will then appear which looks like the screenshot below. From here, you would need to follow the instructions which will be given by the wizard so you can start the system restore process. First thing that needs to be done is open the “Control Panel” then on the main “Control Panel” Window, click on “System and Security”. On the “System and Security” Window, simply click on the “System” link and you’ll be directed to the System Window which looks like the screenshot below. 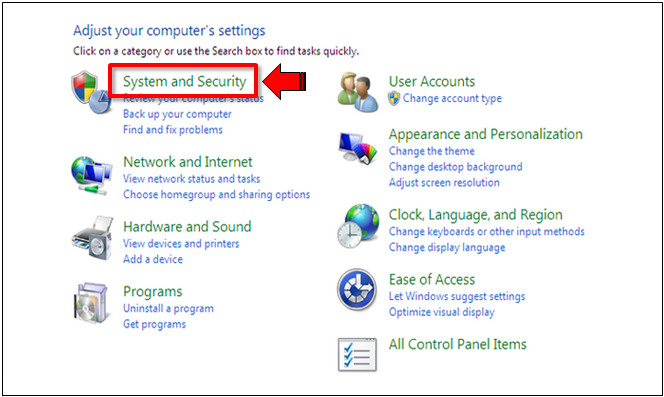 From this Window, you need to click again on the “System protection” link found at the left side panel of the screen as shown below. After doing so, the “System Properties” Window will appear and or will take you directly to the “System Protection” tab. The options on this tab gives you options and settings which you can do with the “System Restore” tool so you can control how it functions. If in case your computer refuses to boot, you can still use the “System Restore” tool. To find out more about the details of how this is done, please read our article on “How to Use the System Recovery Options in Windows 7“. First, you need to access a hidden system menu by pressing the “Windows + X” keys. After pressing on these keys, a system menu will appear which looks like the screenshot below. From this menu, click on “Control Panel”. 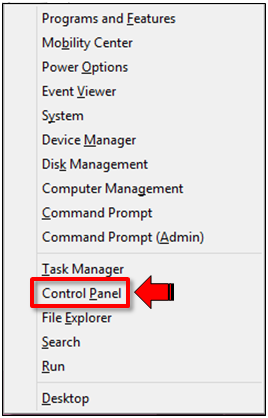 Next, on the “Control Panel” Window simply click on the “System and Security” link then on the following Window, click on “System”. You will again arrive at the System Window the same as in Windows 7 and from here, you need to click the “System Protection” panel located on the left side panel. After clicking or tapping on the “System protection” link, the “System Properties” Window will appear just like in Windows 7 and it will take you directly to the “System Protection” tab. 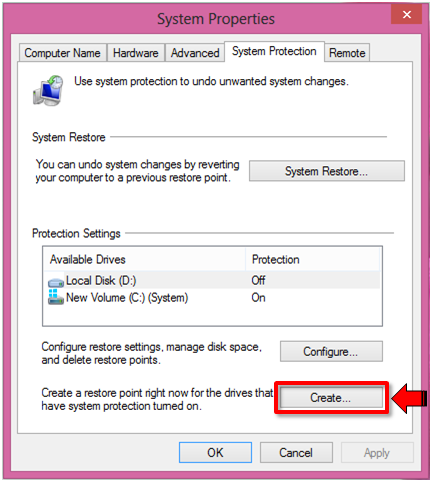 On this section, you can change the system restore settings and tweak its other aspects before finally proceeding with the “System Restore” process. Another way of doing this is by searching for “system restore” on the “Start Screen”. To do this, simply open the “Start Screen” and type “system restore” and you’ll see that the search screen will appear. From here, you need to filter the results by “Settings” and click on the “Create a restore point” link from the search results found at the left portion of the screen. From this point forward, the process will be the same both on Windows 7 and Windows 8. The screenshots that I will be showing on the steps that would follow are all taken from Windows 8 but it looks basically the same on Windows 7. 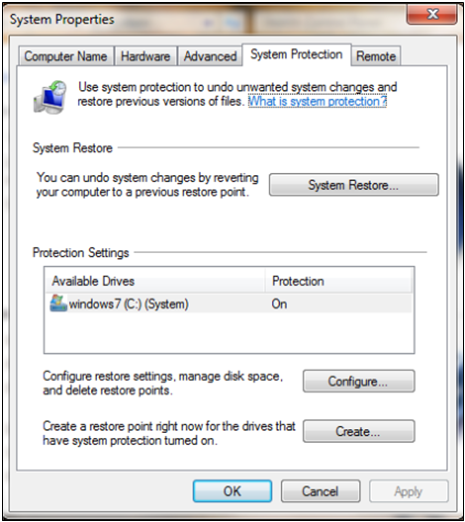 Creating a restore point both on Windows 7 and Windows 8 works basically the same. All you need to do is click on the “Create…” button located at the bottom of the “System Properties” Window. On the Window that follows, you need to type the name of the restore point that you want to create and afterwards, click on the “Create” button. Next, another Window will appear which contains a progress bar showing the overall progress of the restore point creation process. Just wait for few minutes until it is done. Once the process is done, you will see a prompt that says “The restore point was created successfully”. From here, all you need to do is click on the “Close” button located at the bottom and you can now use the restore point you created at any future time when you experience problems on your computer. 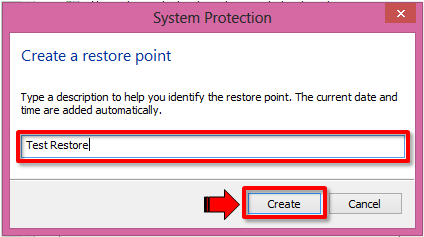 As you can see, creating a restore point and using it on Windows 7 and Windows 8 is not that hard a process. You can use restore points anytime especially when problems arise which affects the overall performance of your system. Doing a system restore is also a quick solution which protects the files that you worked on even after the process is done. Tell us what you think about this feature. If you have any concern about your Windows machine or other questions related to the Windows Operating System please feel free to post them on the comments section below.